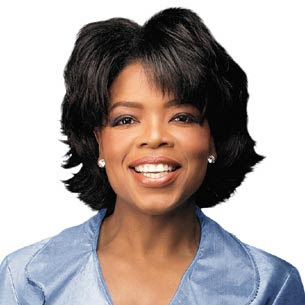 Coming from poor surroundings and being sexually abused at young age, Oprah Winfrey was ranked as the world's most influential woman and the richest African American of the 20th century. She won the Miss Black Tennessee beauty pageant and was nominated for an Academy Award for Best Supporting Actress, but it is through her talk show "Oprah Winfrey Show" that her influence has been greatest. The talk show has influenced and inspired people not only in television but also in society in general. Popular as talk show host, she started her own production company, founded "O, The Oprah Magazine", established "Oprah & Friends" radio channel, launched "Oprah.com" website , and started "Oprah Book Club". She is making more and more money from her many business. How many of us never satisfy with our own life and always ask for more ? Oprah is certainly a very influential person. ABSOLUTELY! Incidentally, I found your blog through a link on Lovely Things in my Life. That's true....so we should be grateful for what we have and we should acknowledge our God because He is our provider. Without him, where do we get our strength, our ability and our opportunities to attain what we have. i am glad i come by this blog today.i av just finished complaining to my colleague and who else will listen about our work/office situation when i happen upon your blog thru EC.Thanks so much for this message of hope, i am extemely grateful for what i av. Great Article. I personally made my own Daily calendar sheet template in Publisher and added a box for "Today's Gratitude Journal"...it is great for me because I can just add a snippet or two to my journal entry and it gives me the opportunity to document daily what I am grateful...the moment or two of comtemplation for that exercise is grounding and rewarding. hi !!! good blog !!! click 2 adds also even i did the same fro u !!! It is difficult to think this way when one has been accustomed to so many material things. It is only when people experience or suffer some form of loss that they start to get the epiphany of their lives. Maybe, because there is no choice or a miracle happens and wham! And the realization - there's so much already to begin with. We Are Pleased To Announce The Launch Of Movies Gallery 08, Mobile Movies in 3gp format, Reality show, Funny Video, Upcoming Movies 08 Trailer, About Dubai,Real Estate, Tips Of Career And Many More. reading make you sharp..please do drop by to my blog..
"hi, that's ok. i'm going to leave you on since we're friends. cheers michael"
every material things is vanity. If we focussed on those things its useless and endless. Contentment and following GOD's way of life are the key to have a happy life. Yes money gives power but such can also destroy.